If you always do what you have always done you will always get the same results. If you need your marketing to do more maybe it’s time to outsource your activity – choosing a service provider is an important decision for any company, particularly if you’re looking to build a long lasting mutual business relationship. If you are starting a new business, looking to generate additional demand for your products or services, or exploring a market sector, your choice of marketing partner can mean the difference between profit and loss or success and failure. So, where do you start? At the beginning – with yourself! Take some time to evaluate where your business is and where you want it to be. What are your short and long term business goals? What are you already doing that is working well for you? What’s not? What are the skills or resources that you need? Why do you want to out source your marketing effort – what barriers prevent you from doing it yourself? As a small to medium-sized business owner you will experience many pressures; time, money and resources, as well as overseeing the day to day activity of your business operations. What are the marketing skills and resource gaps that you need to increase business demand? Don’t forget the specific tasks or activities that you simply just don’t have time to do or that you don’t enjoy, for example telemarketing. Personally we love telemarketing but if you don’t it’s understandable that this may be an activity that you neglect. You will also need to think about your bottom line and your marketing budget. What are your expectations of a return on your investment? Marketing is not an instant fix and you should expect to see results (dependant on the type of marketing activity and your product and services) within two to three months. Recommendations are a great way to find service providers. Ask family, friends and colleagues for their advice. Trade bodies or professional organisations may also hold information about marketing companies that work within your sector. Networking events are an opportunity to meet new business contacts, so work the room and don’t be afraid to ask questions. And don’t forget social media; LinkedIn is a great way to get introductions and make new connections. Most marketing companies are happy to have an initial conversation with you over the telephone and offer some free advice or guidance. If they don’t, cross them off your list. The best marketing companies are receptive and never pushy. They listen and ask the right questions about your business. You should feel comfortable and at ease. If you want to find out more about what they have to offer and you’ve established some common ground, it’s time to arrange a face to face meeting. Most people make a judgement about those they meet fairly quickly, both on a personal and business level. Instincts can work well for the experienced business owner and should form part of the decision making process. Ask lots of questions at this point, and also for specific examples or case studies demonstrating how the marketing company work and what successes they have had on behalf of their clients. We always try to meet our potential clients at their office or place of work. This is important to gain a real insight into how they work and how we may best integrate our services within their business. Why not visit the marketing company and get a feel for how they work, meet the team who may potentially play an active part in your marketing effort. Meetings should always be followed up in writing. We always provide a summary of a meeting and, where appropriate, our recommendations together with an overview of our suggested strategy and an explanation of the next steps. It’s likely that you will have met with two or three marketing companies. Now is the time to make your decision. Think about personalities and synergy. Your chosen marketing partner should have the ability to become an integral part of your own business. Do you share a similar culture? Do they ‘get’ what you do? Would you feel confident in their ability to represent and promote your business? Don’t hesitate to go back and ask more questions and arrange a further meeting. We started this article by talking about how crucial it is to choose the right service provider for your company. It’s important to gather and consider as much information as possible to empower you to make the decision that’s best for your business. A decision that will ultimately lead to a more successful and profitable business. 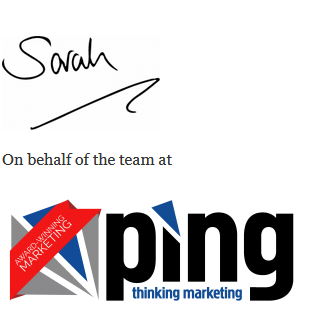 For more advice on any aspect of the marketing process please call us on 0330 041 4550, email us at hello@pingmarketing.co.uk or use our live chat facility at www.pingmarketing.co.uk.